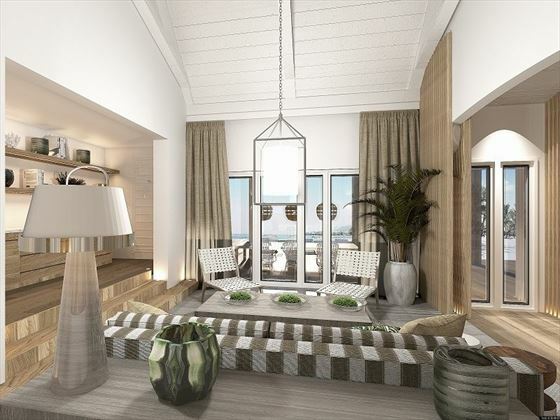 LUX* Grand Gaube will reimagine luxurious island living, offering timeless glamour amongst northern Mauritius’ stunning natural beauty. Nestled in the quaint town of Grand Gaube, LUX* Grand Gaube boasts some of the most incredible views of the Indian Ocean. We love the eclectic mix of interiors here. Vintage rattan furnishings and cool ceramics are blended with vibrant murals designed by French artist Camile Walala, whilst bright and beautiful wild flowers bloom against the authentic African decor and Gouzou illustrations by French street-artist Jace. 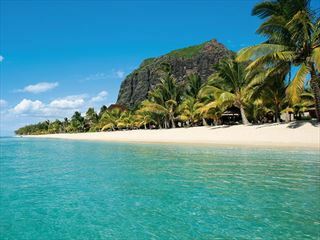 LUX* Grand Gaube’s unique design is perfect for trendsetting travellers hoping to enjoy a modern insight into the Mauritius lifestyle. The rooms are just as contemporary and stylish, with gorgeous views from every window, and plenty of space to relax with loved ones. 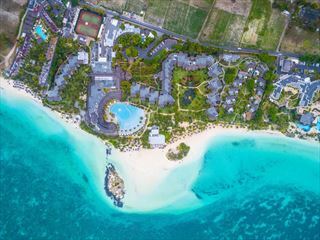 Honeymooners will relish an idyllic stay in a Romantic Junior Suite, featuring their own spacious balcony and outdoor bathtub for two, whilst the Ocean Villas are great for families hoping to have their own private space with a garden, pool, and 24-hour butler service. LUX* Resorts are well-known for their wonderful sensory experiences, and LUX* Grand Gaube is no different. The restaurants here are innovative and delicious, offering a dining experience that goes beyond sumptuous flavours. Wander along to Banyan, the restaurant complex set in front of a towering, twisty Banyan tree, taking in decadent smoky smells of charcoal-cooked meat at Creole Smoke House, sneaking a taste of the Sugar Island at Rum Treehouse, indulging in a succulent burger at BB’s, or simply enjoying a tipple at French Kiss – a vintage van-turned-pop-up-bar. The LUX Me Spa is another sensory experience you won’t want to miss, reconnecting you to your mind, body and soul with amazing treatments and the hydrotherapy pool. The complimentary non-motorised water sports are a welcome break from sunning up the sun on a sun lounger, whilst the two pools are perfect for a refreshing dip. 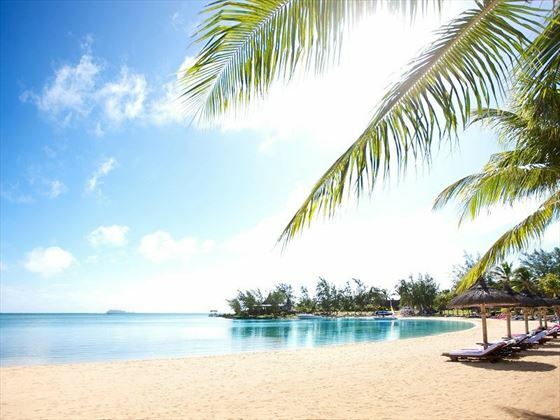 This spectacular resort is located in Grand Gaube, a small town nestled along the northern coast of Mauritius. 10 minutes away from Grand Bay. Superior Rooms – Minimalist 51sqm rooms with the standard amenities. Sleeps three adults, or two adults and one teen, child or infant. Deluxe Rooms – Dotted around a quiet bay, these charming rooms are located on the ground and first floor and offer peacefulness and privacy. Sleeps three adults, or two adults and one teen (over 16 years). 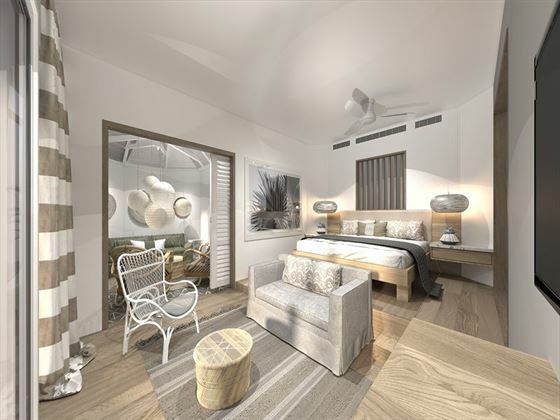 Junior Suites – Gorgeous 56sqm suites featuring a secluded terrace and direct access to the beach. Sleeps three adults, or two adults and one teen, child or infant. Family Suites – Spacious 85sqm suites featuring a king size bed and large double bed sofas for children, plus a walk-in dressing room. Sleeps four adults, two teens or two children and one infant, or two adults, four teens or four children and one infant. 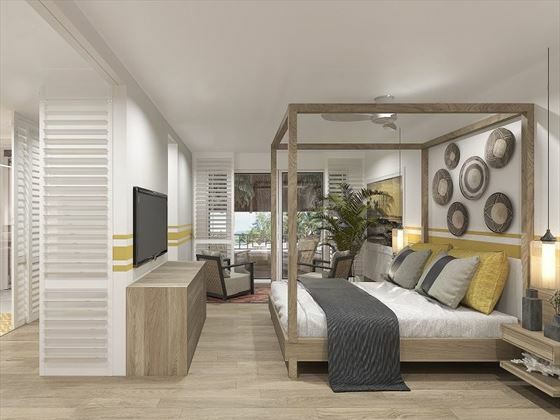 Romantic Junior Suites – Stylish and modern 70sqm suites with sleek décor, a spacious balcony with chill out loungers, and an outdoor bathtub for two. These intimate and secluded suites are ideal for honeymooners. Sleeps two adults and one teen, child or infant. Prestige Junior Suites – Intimate 75sqm suites nestled on a secluded bay on the ground floor in the adult only section, featuring a large terrace with a lounge and dining area, and a private pool. Sleeps three adults or two adults and one teen (over 16 years). 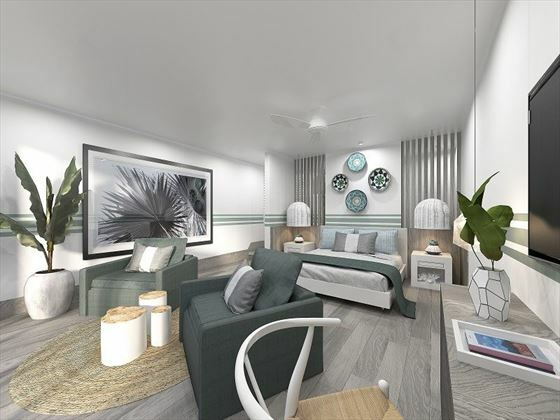 Ocean Villas – These two stylish 100sqm villas are perched in their own private garden, featuring a private pool, al fresco lounge and dining area, and 24-hour butler service. Sleeps four adults, or two adults and two teens or two children and one infant. LUX* Villa – The most opulent villa, offering total privacy, an outdoor lounge and relaxation deck, a swimming pool, a gazebo, and a 24-hour butler service. Nestled on a private peninsula, and with its own private beach. Sleeps four adults, two teens or two children and one infant, or two adults, four teens or four children and one infant. 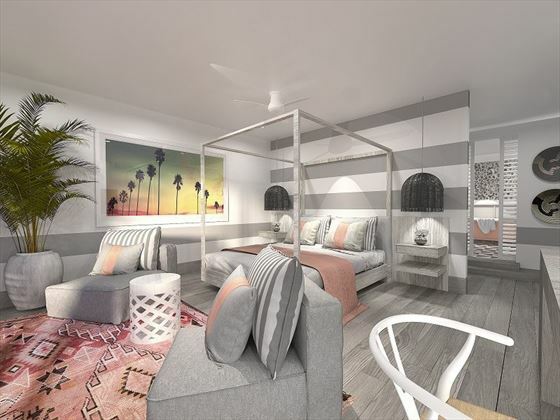 Palm Court – With open indoor and outdoor seating and gorgeous ocean views from every seat of the house, you’ll have a gorgeous backdrop as you tuck into a wide variety of sumptuous international cuisine. You could even sit by the kitchen counter and watch the chefs create their culinary masterpieces. Open 7am-10.30, and 7pm-10.30pm. 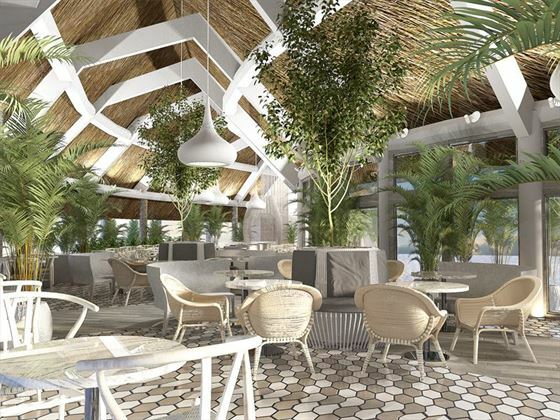 Palm Court Bar – Offering the largest selection of Prosecco and cider in Mauritius, plus a number of great local and imported beers, this stylish bar is the ideal spot for a pre-dinner drink. Open 10am-12am. Creole Smoke House – Serving up sensational cured fish and meat, cooked on charcoal or in a smoker from the USA for a delicious smoky taste. Open 12.30pm-3pm, and 7.30pm-10.30pm. BB’s – A trendy restaurant offering innovative burgers. Open 12pm-4.30pm. 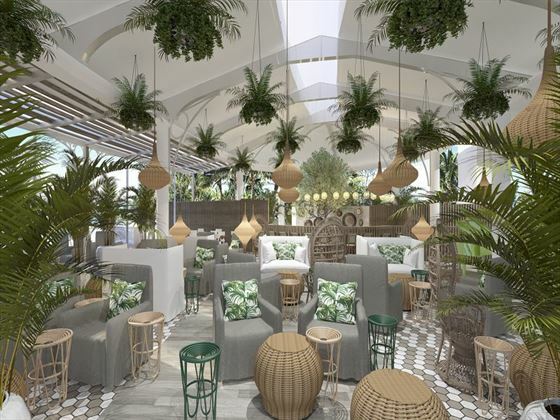 Rum Treehouse – Budding rum connoisseurs will love this kooky bar, offering a wide selection of 88 rums, used to create innovative rum cocktails. Open 6pm-10.30pm. French Kiss – A quirky Citroen H van converted into a cool pop-up bar. Open 10am-6pm. Bodrum Blue – Nestled on its own little peninsula, this Turkish restaurant is the perfect spot for a romantic dinner for two, with delectable dishes inspired by Bodrum’s coastline. Open 12.30pm-3pm, and 7pm-10.30pm. 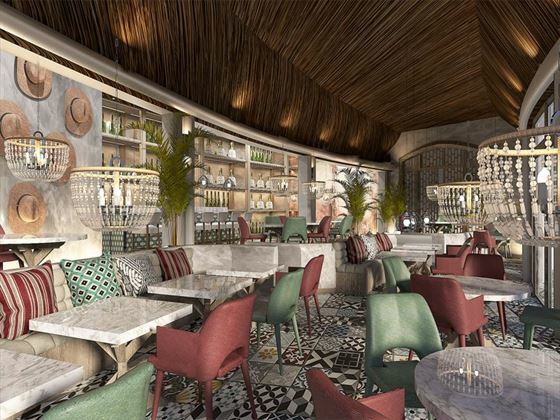 INTI – Mauritius’ first Peruvian-Argentinian restaurant offers a flavoursome taste of Latin American cuisine, with a gorgeous outdoor garden overlooking the beach, and a fun bar with a live DJ every night. Open 7pm-10.30pm. Beach Rouge – The ideal spot for a casual lunch, this eclectic menu includes succulent steaks, rustic pizzas and delicious seafood during the day, before turning into a party-loving beach club at night. Open 12.30pm-3pm, and 7pm-10.30pm. G&T 100 Club – A cool gin bar with wonderful sunset views. Open 12pm-7pm. Café LUX* - A charming coffee shop with locally roasted coffees. Open 7am-11.30pm. ICI – The resort’s ice cream brand offering delicious flavour combinations, including pistachio and bubble gum, all served in home-made waffle cones. Open every afternoon. Two swimming pools and two tranquil beaches. LUX Me Spa – A sensational spa experience, offering bespoke therapies and treatments within 11 treatment rooms. There is also a sauna and steam room, a hydrotherapy pool, a hair salon, and a barber shop. Complimentary non-motorised water sports, including water skiing, windsurfing, snorkelling, stand-up paddle boarding, and glass-bottom boat trips. Motorised water sports with an additional price, including speedboat rides, scuba diving, big game fishing, catamaran trips and private water skiing. The Edit – a shopping area with Mauritian souvenirs, a make-your-own-jewellery station, collaborations with designers, and a retail-therapy bar. PLAY – A fun kid’s club for children aged between 3-11 years old. Activities include cinema trips, beach and pool games, crab hunting, Creole fashion shows, cake decorating, treasure hunting, dance parties and face painting. Exciting activities can be organised for teens aged 12-17 years old, including tennis lessons, fishing, pedalo competitions, and water polo. An extensive range of amenities are available including strollers, baby monitors, bottle warmers and many more. There is also a large selection of baby food and specially created children’s menus. Receive 70% discount for the second person, or 35% discount off both travelling.